The 2017 Volkswagen Passat is a midsize sedan that is designed for the American lifestyle and built in Volkswagen’s state-of-the-art factory in Chattanooga, Tennessee. It features a winning combination of interior and exterior design, advanced technology, available driver assistance features, and a powerful and highly efficient base engine. 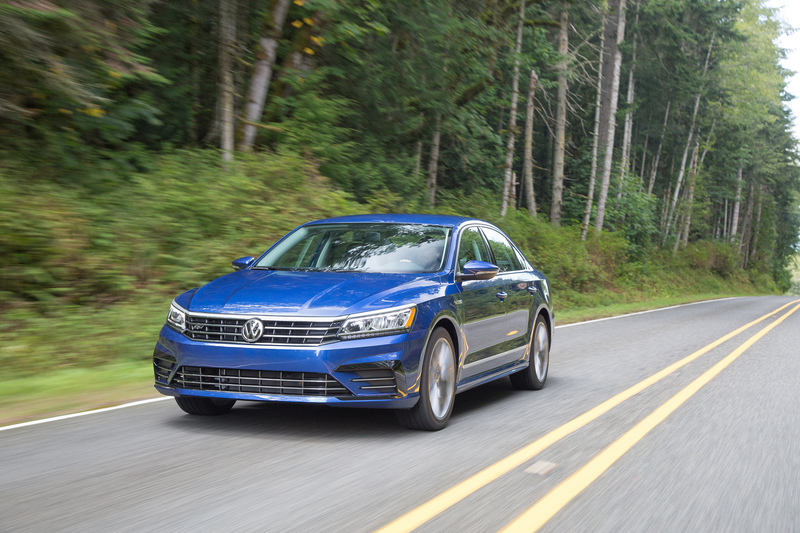 Redesigned in 2016 with fresh sheetmetal, a revised interior and new connectivity and available driver assistance systems, the Passat sees relatively minor changes for 2017. However, the trim structure has been repositioned, with driver assistance, connectivity, and convenience features being moved into lower trim lines, thus offering a great value story. The R-Line model takes a step up with features that include: Composition Media touchscreen radio with USB connectivity, voice control, SiriusXM Satellite Radio® 3-month trial, and Volkswagen Car-Net® App-Connect technology; Forward Collision Warning and Autonomous Emergency Braking (Front Assist); Blind Spot Monitor with Rear Traffic Alert; a power driver seat; V-Tex leatherette seating surfaces; and heatable front seats. An available Lighting Package adds LED headlamps with LED DRLs and LED taillights. The SE adds KESSY® keyless access with push-button start and Blind Spot Monitor with Rear Traffic Alert, as well as an available Lighting Package that takes the R-Line lighting package features and adds foglights. The SE with Technology model, available with either the 1.8T or VR6 engine, adds remote start, Park Distance Control (Park Pilot), 18-inch aluminum-alloy wheels, and LED headlamps and taillights. Pricing for the 2017 Volkswagen Passat with standard 6-speed automatic transmission starts at $22,440 (plus $820 destination). 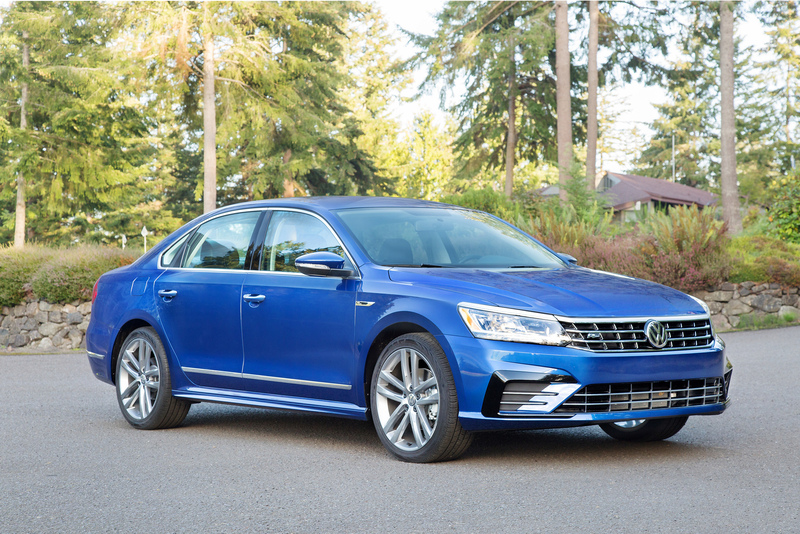 The 2017 Passat features the styling upgrades that were introduced for the 2016 model’s facelift. Slimmer headlights, a more substantial fully chromed four-bar grille, and the muscular hood all work together to give the Passat a wide, planted stance from the front. Standard chrome window surrounds and trim on the doors add to the premium nature of the design, as do available LED headlights and LED taillights. At the rear, the bumper and trunk lid help to shape the 2017 Passat’s look. The car has a premium European-style flush rear license plate area and a chrome strip on the trunk that connects the trunk lid to the taillights, making the rear lights appear lower and enhancing the grounded appearance. 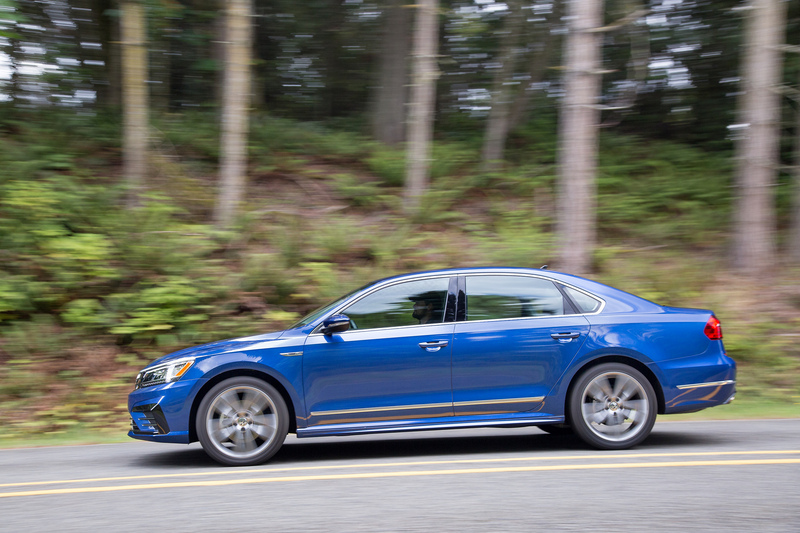 The 2017 Passat remains a generously-proportioned four-door sedan. Nose to tail it measures 191.9 inches and features a stretched 110.4-inch wheelbase and 72.2-inch width, which allows for an exceptional 39.1 inches of rear-seat legroom. The Passat can be had in 8 colors, including Urano Gray, which is available exclusively for the 2017 Passat R-Line. 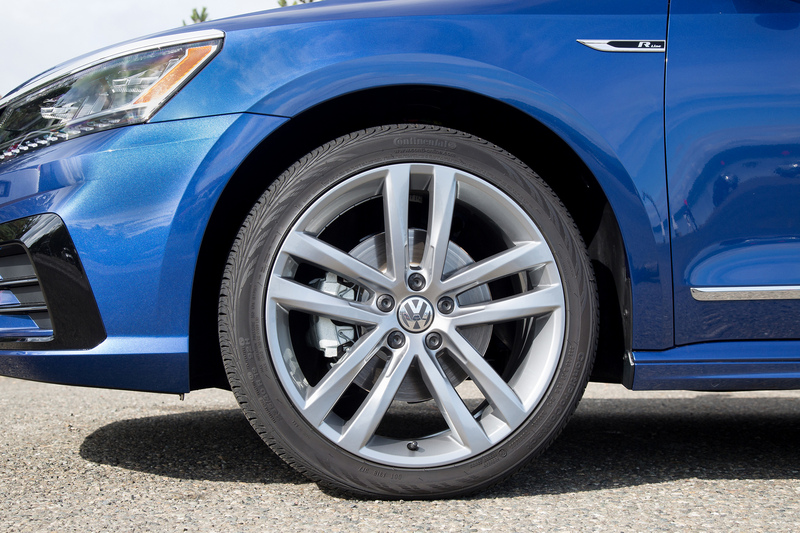 The 2017 Passat R-Line is the most sporting variant, featuring unique rocker panels, a stylized front bumper with contrasting black accents, a modified rear diffuser, and anthracite-color Salvador aluminum-alloy 19-inch wheels shod with 235/40 all-season tires. Select 2017 Passat models have an Easy Open trunk, which allows the driver to sweep their foot under the rear bumper to activate a sensor near the rear of the vehicle, opening the trunk hands-free. The driver’s key must be within three feet of the trunk to use the Easy Open feature. Designed and specifically tailored for the U.S. market, the Passat delivers plenty of space for five adults. Ingress and egress is nearly effortless with large, wide-opening doors, and the large trunk can accommodate 15.9 cubic feet of luggage. Inside the 2017 Passat, the dashboard and center console, along with integrated two-tone decor panels, are first to catch the eye. The top of the dashboard is structured with sharp contours and a sculpture line, acting to frame the elements underneath. The instrument cluster features two large dial faces and a display screen set between them, while a frameless rearview mirror (available on the SE with Technology trim and above) provides an understated touch of elegance. Chrome trim pieces—including the bezels around the air vents, upper door trim, cupholders, and shift lever—help to add to the premium feel of the interior. 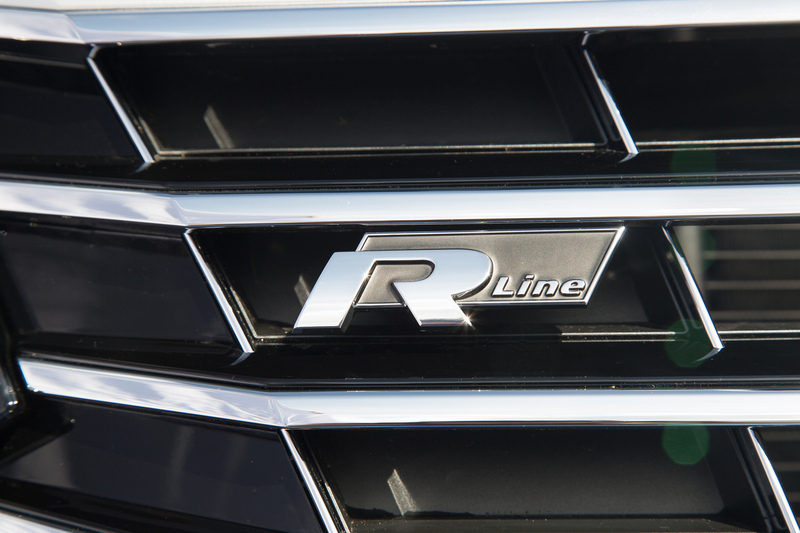 The R-Line adds stainless steel pedal caps, a multi-function steering wheel with paddle shifters and R-Line specific door sill plates and décor. The 2017 Passat features MIB II, the latest generation of Volkswagen infotainment systems. 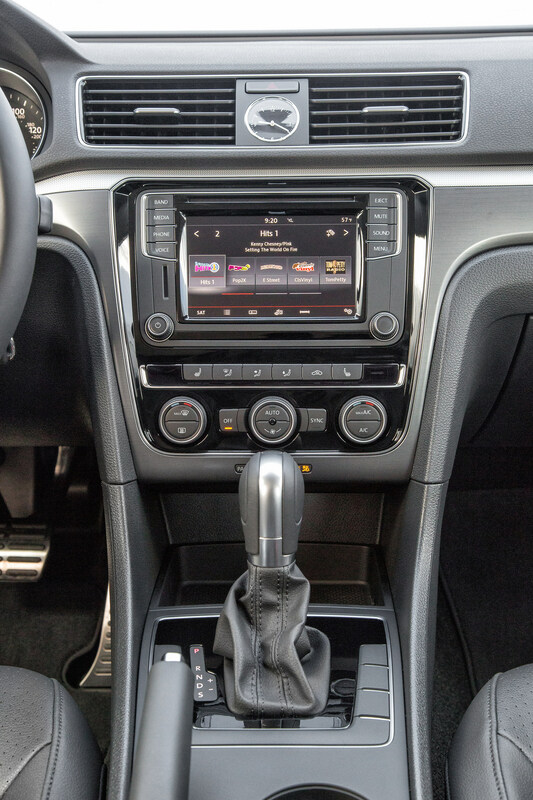 With touchscreens as standard equipment on all models, MIB II is available with either a 5- or 6.33-inch display across three trim head units (Composition Color, Composition Media, and Discover Media), all offering an impressive range of features. On most models, the display utilizes a capacitive touch sensor (similar to smartphone and tablet technology) that enables gesture controls like swiping and pinch-zooming, as opposed to resistive touchscreens that require pressure and have slightly longer response times. MIB II also features a proximity sensor, which can detect when a hand is nearby and automatically switches its display to allow easier selection of specific features. USB and Bluetooth® connectivity for compatible devices are standard on all 2017 Passat models. Two phones can connect at the same time and occupants are able to make and receive calls on each. 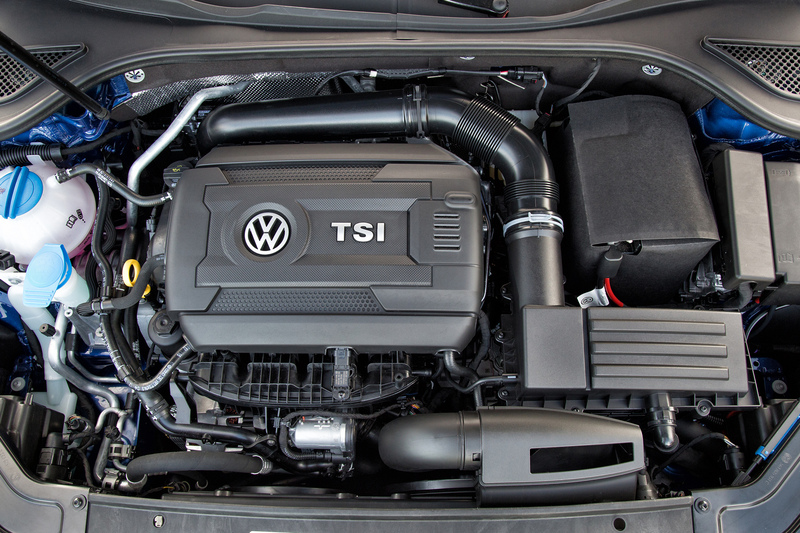 The MIB II system also serves as the foundation for Volkswagen’s available Car-Net®, one of the most comprehensive suites of connected vehicle services and features available in the automotive industry. Car-Net features include App-Connect technology which allows integration with three major smartphone platforms—Apple CarPlay®, Android Auto™ and MirrorLink®—allowing integration for compatible smartphones. With Car-Net Security & Service features, available on the SE models and above, you can use your laptop or compatible smartphone to locate your parked car, access a vehicle health report, make service appointments, load destination information before leaving the house (or get information while on the go), and much more. Security & Service also has Family Guardian capabilities: owners can set boundary or speed alerts for their Volkswagen models, and receive a text or email message if their set speed limit or approved area is exceeded. Automatic crash notification, manual emergency calling, and Roadside Assistance features are also included. Remote door locks are also accessible through the Car-Net Security & Service mobile app. On SE w/Technology models and above, Car-Net Guide & Inform features include a 4-year trial of traffic updates with SiriusXM Traffic. A three-month trial of SiriusXM Travel Link, which provides weather, sports, news, ski resort and movie information, and gas prices, is available as well. The built-in navigation system that is fitted to this trim can learn your most frequent destinations so you can quickly choose a location rather than enter the same details over and over. The destination interface can predict and auto-complete search requests as you enter a location. The 2017 Passat lineup features two engine options: the 1.8-liter TSI® turbocharged four-cylinder or a powerful 3.6-liter VR6®. The four-cylinder Gen 3 EA888 turbocharged and direct-injection engine is made in Silao, Mexico. This 1.8-liter engine produces 170 horsepower at 4,800 rpm and 184 pound-feet of torque from 1,500 rpm on regular gasoline. The EPA estimated fuel economy is 23 mpg city and 34 mpg highway. 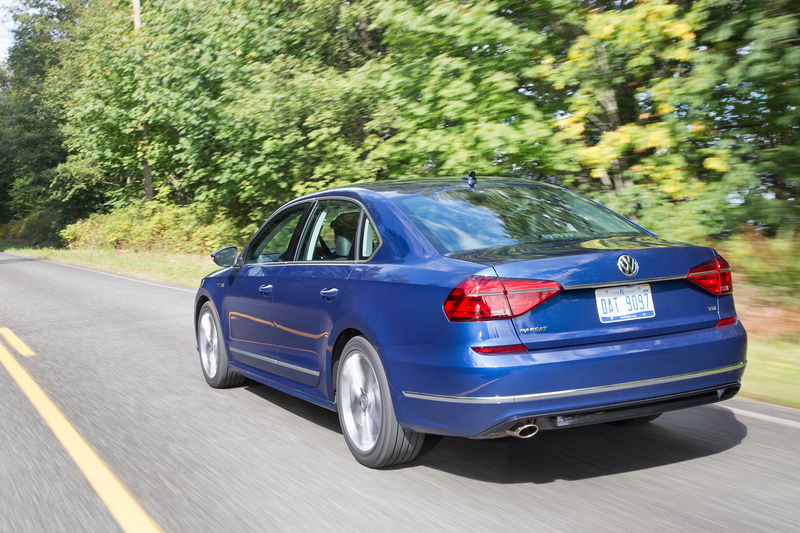 Passat models equipped with the 1.8-liter engine are offered with a 6-speed automatic transmission. The 3.6-liter VR6 makes the 2017 Passat a true sport sedan. Producing an impressive 280 horsepower at 6,200 rpm and 258 lb-ft of torque at 2,500 rpm with premium fuel, it offers power and luxury-class driving comfort with surprising fuel economy—EPA estimated highway mileage is 28 mpg. The VR6 is capable of running on regular gasoline. Shifting on the Passat VR6 is handled by a standard 6-speed DSG® dual-clutch automatic transmission, which features steering wheel-mounted paddle shifters on the SEL Premium. Volkswagen’s Automatic Post-Collision Braking System, first launched on the 2015 Golf, comes standard on every Passat for 2017. The system builds on the premise that a collision is rarely a single, instantaneous action, but rather a series of events that follow the initial impact—which can cause additional collisions. The Automatic Post-Collision Braking System helps address this by applying the brakes after a primary collision is detected by the airbag sensors, thus helping to reduce residual kinetic energy and, in turn, reduce the chance of additional damage. Every 2017 Passat model is equipped with a standard rearview camera, to aid drivers while in reverse. The camera image is projected on the touchscreen in the center stack and the MIB II units allow the brightness of the camera image to be adjusted independently of the rest of the display. Adaptive Cruise Control (ACC) uses forward facing radar to maintain a set speed while helping maintain a set distance to the vehicle in front. The driver sets the speed and the desired spacing via buttons on the multifunction steering wheel and can use the accelerator, brake pedal, or a steering wheel button to cancel or override the ACC function. All system messages appear in the central multifunction display. When the roadway ahead of the vehicle is clear, the system can maintain the driver’s set speed. ACC can match a vehicle’s speed in front down to 12 mph, as well as resume ACC control after the driver presses the “resume” button on the steering wheel when the speed is above 16 mph. ACC is standard on SE w/ Technology models and up. Forward Collision Warning and Autonomous Emergency Braking (Front Assist) uses the same radar as ACC to help warn the driver of critical front-end collision situations, visually with a warning symbol in the instrument cluster and acoustically above 31 mph. If the driver fails to brake, Autonomous Emergency Braking is activated to help slow the vehicle. If the brake pedal is applied but the driver brakes too lightly, the brake pressure is increased by the system. In 2017, Front Assist is standard on all trim levels. The available Blind Spot Monitor system uses two radar sensors at the rear of the vehicle to scan the approaching traffic and help warn drivers of vehicles in adjacent lanes. If the driver uses the turn signal to indicate a lane change while a vehicle is detected in a blind spot, or a vehicle is approaching in the adjacent lane, the system utilizes a flashing LED symbol in the outer area of the side mirrors. Blind Spot Monitor is standard on R-line models and up. The available Rear Traffic Alert system not only helps alert the driver to stationary and moving vehicles directly behind, but also helps to detect vehicles approaching from the side (above 3 mph) that may be difficult for the driver to see while reversing. It offers a sizable range of about 65 feet, and can present a visual and an acoustic warning, before applying the brakes if a potential impending collision is detected. The system is activated by selecting reverse gear. Rear Traffic Alert with braking is standard on R-line models and up. If the vehicle does not detect steering wheel input for a defined period of time, the available Lane Departure Warning system (Lane Assist) actively counter steers to keep the vehicle in the lane when above 40 mph and lane markings are visible. The system’s camera recognizes visible lane markings and, using a special algorithm, determines the vehicle position in the lane. If the vehicle crosses a lane marking without the driver using a turn signal, the system provides a visual signal in the instrument cluster, asking the driver to take over. Lane Assist is standard on SEL Premium models, which are also equipped with the Active Blind Spot Monitor system with corrective steering. If the driver uses the turn signal to indicate a lane change or if the front facing camera senses a lane change, the driver will not only be warned through the flashing LED symbol, but the car will also help actively keep the car in its lane within the limits of Lane Assist. Available Park Distance Control (Park Pilot) uses ultrasonic sensors located in the front and rear bumpers to monitor a range of up to five feet in front of or behind the vehicle. The system is activated when reverse gear is engaged or below a speed of 9 mph and helps provide guidance when parking or in tight situations. The system provides static and dynamic guidance lines in the camera screen when reversing to assist the driver in assessing distances for parallel and perpendicular parking. It also presents visual warnings when the car starts to approach parked cars or static objects from the front or rear, unless turned off. 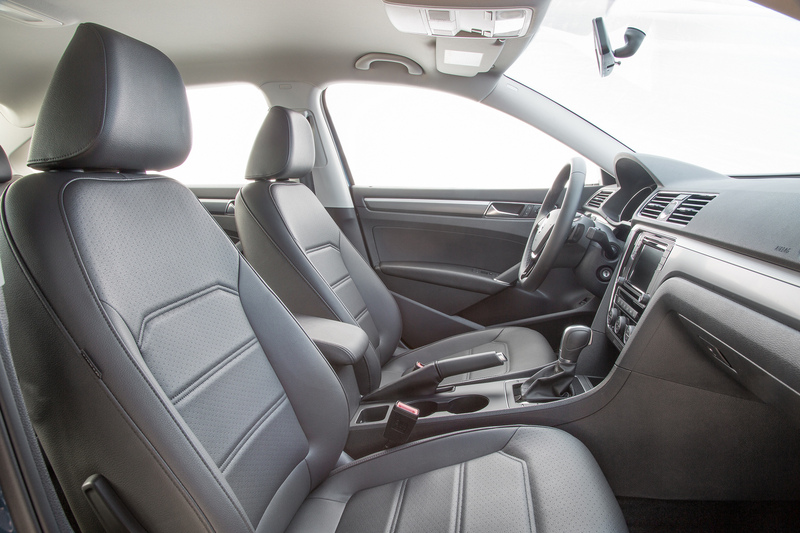 Park Pilot is standard on SE models equipped with the Technology Package and up. The available Parking Steering Assistant (Park Assist) can automatically steer the car into parallel and perpendicular parking spaces in reverse. After pressing the Park Assist button—once for parallel and twice for perpendicular—the driver needs to actively control the accelerator and brake and gear selection, as Park Assist automatically steers the vehicle into the parking space. The driver can override or deactivate the steering assistance at any time by turning the steering wheel, disengaging reverse gear or pressing the system button. Below 25 mph, the system scans both the left-hand and right-hand sides of the road, for example in a one-way street, for any parking spaces as it drives past. By activating the turn signal, the driver stipulates which side of the road they wish to park on. Park Assist is standard on SEL Premium models. $23,975 MSRP (plus $820 destination) with automatic transmission.